Though Boko Haram’s lethality and tactical innovation, al-Shabaab’s resilience, and the brokering of partnerships by al-Qaeda in the Islamic Maghreb (AQIM) have rightfully dominated analysis of political violence in Africa, other situations are also increasingly relevant for those concerned with political violence in Africa. With the escalation of the crisis in Anglophone Cameroon and the October general elections presenting a risk of further increased tensions, the evolution of the country’s conflict and its implications for political violence across the continent is worth noting. 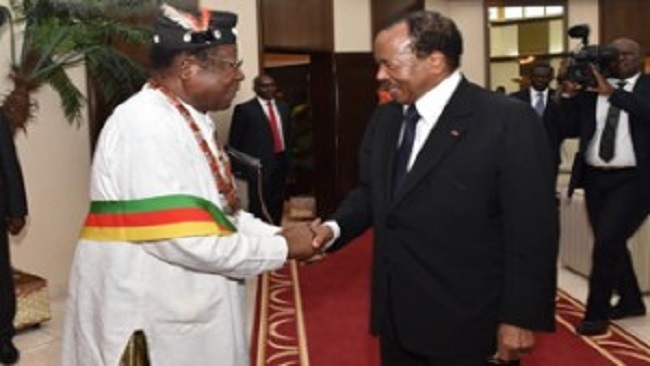 Much can be learned about conflict escalation from the Cameroonian government’s reaction to the calls of Anglophone activists, which has pushed the country towards violent conflict and has made the prospects for peaceful dialogue ever dimmer. The Cameroonian government, historically, has not effectively integrated and engaged its Anglophone population through inclusive governance practices. And since protests erupted nearly two years ago, the Biya administration has not seem inclined to engage in peaceful dialogue to draw down the crisis. Taken together, these suggest that the scale of the conflict, and its lethality, are likely to escalate. The origin of friction between Anglophone and Francophone populations in Cameroon can be traced back to the colonial era. Originally under German rule, Cameroon was partitioned between the French and British into two territories, both governed as trusts. Anglophone and Francophone Cameroonians were unified under a federal system in 1961 after a plebiscite was held in which voters were given a choice to join either Nigeria or Cameroon. It is worth mentioning that, among Anglophone Cameroonians, nearly 60 percent of Anglophones in the majority-Muslim northern region voted to join Nigeria, while roughly 70 percent of Anglophones in the majority-Christian southern region voted to join Cameroon. In 1972, under President Ahmadou Ahidjo, the federal system was discarded in favor of a united, bilingual republic. To this day, however, Anglophone regions are governed by Common Law, whereas the rest of the country is governed by a civil code. Debates over the extent to which the country is dominated by Francophones, what sub-national authorities that the two Anglophone regions should be granted, and various cultural matters, have resulted in a proliferation of Anglophone activist groups and general politicking around the issue. Groups that may seem at face value to be apolitical—including teachers’ unions and legal associations—have taken up Anglophone issues as a part of political campaigns. Anglophones currently make up roughly 20 percent of the country’s population and are undeniably under-represented in President Paul Biya’s government. Since taking power in 1982, less than 11 percent of the ministers appointed by Biya have been Anglophones. At present, just three of the 33 generals in the country and six of the 63-person cabinet members are Anglophones. Even within Anglophone districts, government jobs are often given to Francophone appointees. Though longstanding, the conflict between Anglophone and Francophone Cameroonians took a lethal turn in 2016 when widespread, peaceful protests and strikes emerged. Media reports focused on the role of Common Law lawyers advocating to abandon the Cameroonian Bar Association. Other groups, including the country’s teachers, then joined the protests. After weeks of strikes, gendarmes used tear gas against protesters. Shortly thereafter, four people were killed in clashes with security forces during a protest in Bamenda that arose after the Cameroon Teacher’s Trade Union called for a strike. 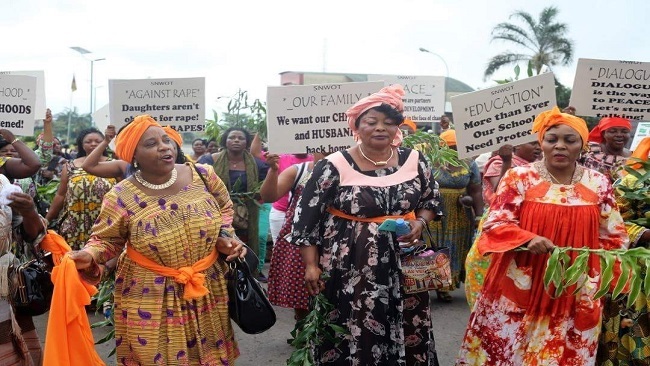 Reports also emerged in late November of sexual violence against students at the University of Buea by Cameroonian security forces. As the protests continued, the Biya government also began detaining and arresting Anglophone activists and journalists and shutting down newspapers and radio stations. Beginning in January 2017 the government cut or greatly slowed down internet services in Anglophone regions. The internet shutdown ended up being one of the longest recorded in sub-Saharan Africa, lasting just under 100 days. The shutdown was economically harmful—given the region’s reputation as “silicon mountain”—and also hamstrung efforts to keep track of events in the region. At the same time, the government also engaged in some conciliatory measures. A National Commission on the Promotion of Bilingualism and Multiculturalism was established and was accompanied in short order by the “appointing [of] Anglophone magistrates and bilingual teachers, and [the] releasing from prison some Anglophone civil society leaders and activists.” According to Amnesty International, however, “these moves were viewed by the Anglophone movements as being too limited,” and the protests continued. The groups that have emerged to advance Anglophone rights have advocated different means and different ends. The vast majority of Anglophone activists advocate for peaceful resolution of the conflict, but as government repression has intensified, groups who advocate secession, or worse, violence, have become more significant. 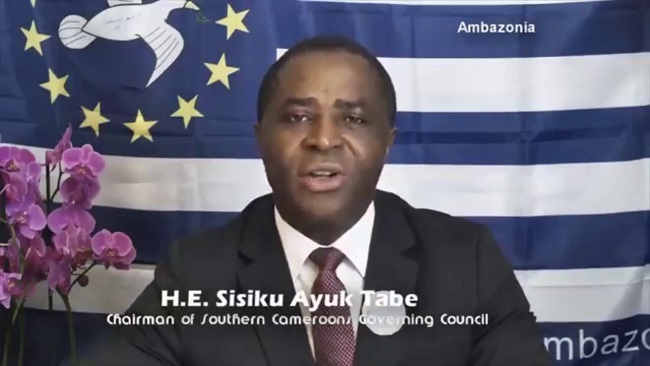 Some groups advocate for more federalism, while others call for secession and the establishment of an independent state called “Ambazonia.” A number of armed separatist groups also formed an umbrella organization, the Ambazonia Recognition Collaboration Council (ARCC), claiming to have thousands of fighters. Through the spring and summer of 2017, however, Anglophone protesters steadily escalated their tactics. Over this period, at least 42 schools and a number of market stalls in Anglophone Cameroon were burned down. A recent report catalogued a number of instances in which Anglophone separatists targeted civilians who did not engage in the demonstrations. The Biya government imposed curfews and increased the security sector’s presence in the region in response. Despite this, Anglophone separatists declared independence on October 1, 2017; in clashes with the state security forces that day, reports indicated that at least a dozen people were killed and 40 arrested. By November 2017, separatists were making attacks on the government more frequently and brazenly. In the Northwest province, for example, they began targeting police with homemade explosive devices. The Biya government stepped up its repression and arrests, labeled the separatists “terrorists” by comparing them to Boko Haram, and declared war on them. Actions taken by armed separatist groups and the government continued to worsen. Separatists are suspected to have kidnapped nine employees of a construction firm and in response to the arrest and repatriation of Anglophone activists that fled to Nigeria, an armed separatist group called the Ambazonian Defence Force (ADF) began abducting government officials. Soon thereafter, a Tunisian national living in Cameroon was abducted and killed, after which the government organized a rescue mission to release 18 hostages, including 12 Europeans. Just this May, a radio journalist and Anglophone activist, Mancho Bibixy, was sentenced to 15 years in prison under the country’s anti-terrorism law in a military court. Four journalists had previously been held under the act until President Biya issued a presidential decree for their release. Bibixy’s conviction has prompted speculation about what sentences could be handed down to the other detained activists and journalists. Throughout this escalation, more than 20,000 people have fled the country for neighboring Nigeria and an estimated 150,000 have been internally displaced. The escalation has transformed a generally peaceful, albeit contentious, debate over the extent and nature of federalism in modern Cameroon into a violent, potentially-existential crisis over the future of the Cameroonian state. Though a number of the characteristics of this conflict are specific to Cameroon, the events of the past few years highlight the importance of inclusive governance measures and the ramifications of heavy-handed security responses to political dissidents. In particular, the Cameroonian experience points to the need to engage moderate political dissidents early and earnestly. In waiting months before attempting to work with the Anglophone community and doing so after violence began to escalate, the Biya administration allowed hardliners and separatists within the movement to mobilize effectively and gain influence. Had the government engaged the initial protests, led by lawyers and teachers, the escalation of the crisis may have been averted. In October, Cameroon will hold elections, which could result in increased tensions. Anglophone territories have previously thrown their support behind the Social Democratic Front (SDF), which currently controls 18 of the 180 seats in parliament. If any perception of illegitimacy in the electoral process takes hold, the current level of violence could take an even deadlier turn. Avoiding an escalation of this kind, and ultimately changing the tone of the current situation, requires dialogue between prominent moderate, non-violent Anglophone activists and the government.